Jarno Trulli turned the pre-season form book on its head with the quickest winter lap at Barcelona's Circuit de Catalunya on Wednesday. The Toyotas have been off the pace for the forthcoming season since unveiling their TF108 car seven weeks ago. But on the last day of official testing before the first grand prix on 16 March in Australia, Trulli blitzed the 4.6km track in one minute 20.801 seconds. Lewis Hamilton - who was quickest on the last two days - was down in 10th. 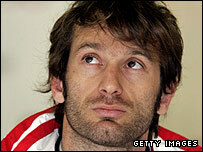 McLaren's British driver had to settle for a time that was over 1.2secs down on Trulli. Red Bull Racing's David Coulthard recovered after tweaking a nerve in his neck on Monday to post the second quickest time, followed by another strong showing from Nico Rosberg for Williams. Hamilton's team-mate Heikki Kovalainen and the second Red Bull of Mark Webber were fourth and fifth, with the Renaults of Nelson Piquet and Fernando Alonso sixth and seventh. Double world-champion Alonso completed the most laps at 128, but was still 0.653secs adrift of Trulli. World champion Kimi Raikkonen was also faster than Hamilton, with the Hondas of Jenson Button and Alexander Wurz at the back of the 19-man field.